From the ten Dogs of the Dow, seven started the first month of the year 2019, with a positive performance. 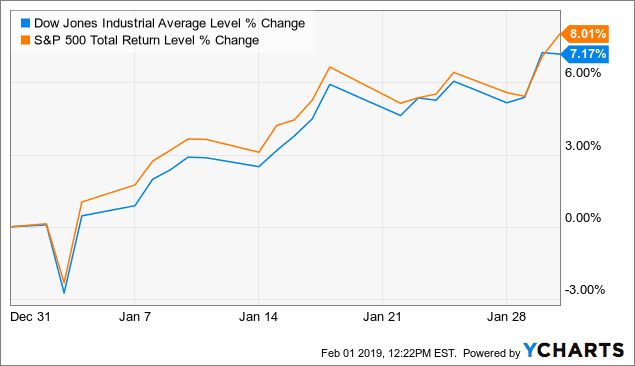 The Dow Jones Index started 2019 with +7.17% and the S&P 500 is also up 8.01% (TR) in January. The price performance of the 10 dogs of the dow is 4.99% and 0.43% dividend. This makes a total return of 5.42% for January 2019. The “small dogs” realized a total return of +3.77%. So let’s have a look at the performance of the Dogs of the Dow individually for the month January. The table below lists all 10 dogs of the dow 2019 companies, sorted descending by dividend yield and lists returns over last month, 3-, 6-, and 12-month periods. Overall a good start of the year, but an under-performance compared to the S&P 500.